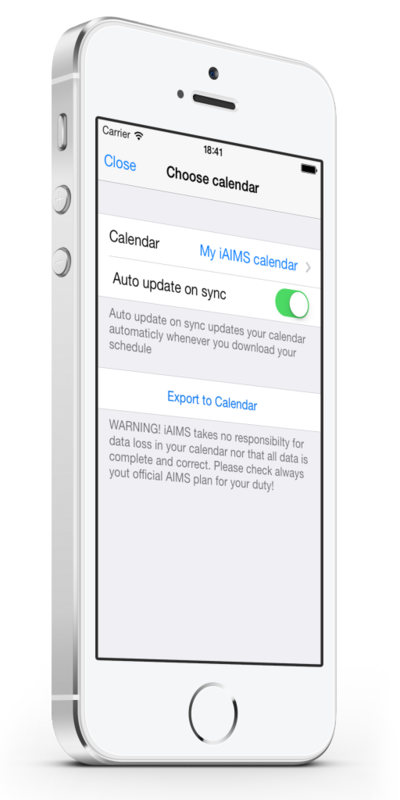 Whenever you download your schedule, iAIMS automatically keeps your calendar up do date. With this handsome feature all your friends are kept up to date automatically. Now you can choose a date from which on the schedule will be downloaded. This is very handsome if you like to check some old rosters or if you would like to have a look at your next month roster. Simply go to settings and select “Days from date”. The rest will be done by iAIMS. Crew’s from these airlines are now able to use iAIMS to download their airline roster. I fixed some minor problems with the calendar export. Now there should be no more double duties and no more crashes on iPad. In one of the next versions i will add a “you have changes” function with the possibility to confirm your changes. If you have any ideas, suggestions or complains feel free to contact me. I will give you feedback as soon as possible.